When: Thursday, March 22, 2018 from 12:30 p.m. – 2 p.m.
Who: Entrepreneurs of all industries! Highly recommended for Business Idea Pitch Competitors! Background: Do you have a passion you’d like to turn into a business? Ready to start writing a business plan? Join us at GCC for a FREE Business Plan Basics workshop to get you started! Great entrepreneurs of our time have great business plans! On March 22, 2018, GCC will host a special workshop that teaches the basic components of a good business plan led by Sam Campanella of the Small Business Development Center. Business Plan Basics will take place on Thursday, March 22, 2018 from 12:30 p.m. to 2 p.m. in room T121 of the Conable Technology Building at GCC’s Batavia Campus. Campanella will also lead a workshop on Idea Pitch Preparation on Thursday, April 12, 2018 from 12:30 p.m. to 2 p.m. to help you prepare to pitch your business idea. This workshop is free and open to the public; you do not have to be participating in the Business Idea Pitch Competition to attend these workshops. To sign up for a workshop, please contact Amy Conley at avconley@genesee.edu. Ready to test out your business idea? Consider participating in a Business Idea Pitch Competition! You could even earn a cash prize! The first-ever local Business Idea Pitch Competition will be held Thursday, April 19, 2018 from 9 a.m. to noon in the Conable Technology Building at the Genesee Community College’s Batavia Campus. 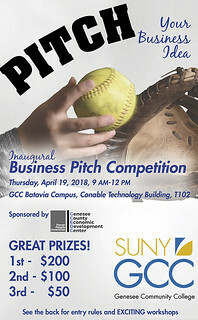 The deadline for competitors to register is Friday, March 30, 2018. Business Idea Pitch Competition details are available at https://www.genesee.edu/home/events/businesspitch/. To register for the Pitch Competition, please contact Dr. Lina LaMattina at lmlamattina@genesee.edu or (585) 343-0055 ext.6319.